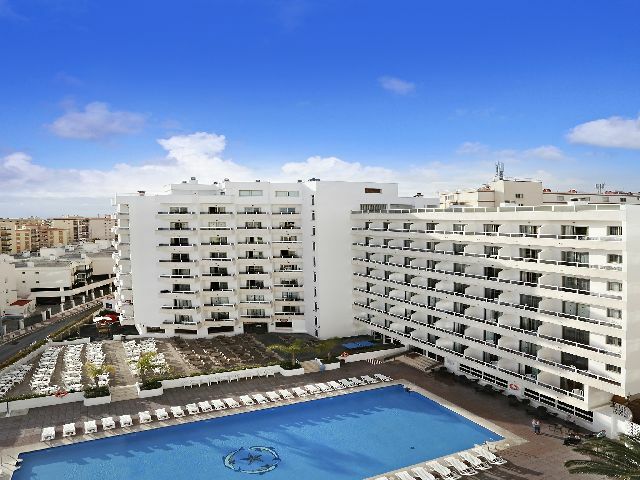 The Marconfort Griego Hotel in Torremolinos was built with family holidays in mind. This big and lively 3 star hotel boasts a plethora of facilities to keep all ages happy from dawn til dusk. The pool area is the real crowdpleaser during the daytime. Choose your spot in the sunshine and top up your tan or relax with the latest best seller under a parasol. The children are in fun times too with their own mini club, play area and entertainment programme. Or why not hop on the shuttle to the beach for sandcastles and a paddle in the sea? When it comes to onsite eateries, there is plenty to keep your hunger at bay. The main restaurant is a buffet style affair with a tasty selection of dishes to choose from. The snack buffet will keep you refuelled between meals, while the four bars have a full menu of hot and cold drinks to quench your thirst. When the sun goes down, the hotel offers up a varied lineup of evening fun. From a mini disco and games to live music and professional shows, the fun continues late into the evening. Discover why the Marconfort Griego Hotel is a favourite place to stay in Spain. 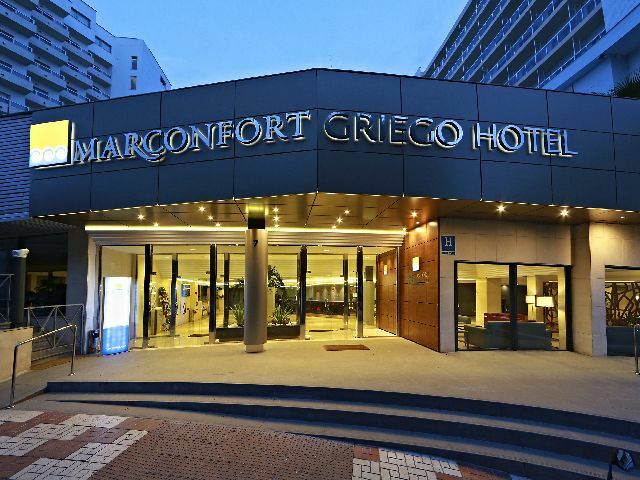 The Marconfort Griego Hotel has all the facilities you would expect from a 3 star hotel in Torremolinos. Highlights include: A large outdoor swimming pool with sun terraces, sunbeds and parasols, poolside bar, snack bar, buffet restaurant, piano bar, themed nights, exterior parking, 24 hour reception with car rental and currency exchange, reading room, TV room, show cooking, shop, transfer to the beach in July and August, free WiFi and internet zone (fee). For the children there is a mini club for 5 to 11 years, entertainment and a play area. On the sports front you will find gym, table tennis and billiards table. The hotel has 417 modern and summery guest rooms. All rooms have air conditioning, private bathroom with bath/shower, safe for rent, cots on request, hairdryer, sofa bed, phone, furnished terrace, satellite TV and free WiFi. There is plenty to tempt your tastebuds at the hotel. The buffet restaurant serves up a vast array of dishes three times a day. Show cooking, kids buffet, vegetarian options and delicious desserts are on the menu too. There is also a snack bar, poolside bar, piano bar and two main bars offering a full selection of hot and cold drinks and tasty snacks. Nighttime entertainment includes professional shows and live music. The all inclusive package at this 3 star Torremolinos hotel includes: Buffet style breakfast, lunch and dinner with mineral water, soft drinks, local beers and wine served during meal times. A selection of alcoholic and non alcoholic drinks and a snack buffet are also included. 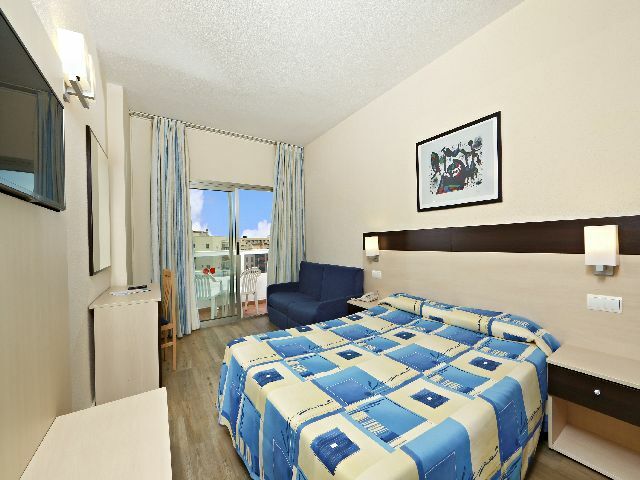 The Marconfort Griego Hotel is located 15 minutes from Bajondillo Beach in Torremolinos. Malaga Airport is 8kms from the hotel. Food wasn’t what we expected and not much to choose from. No heating ended up with blankets and a radiator. Asked for a double bed got two singles pushed together. Entertainment in the hotel wasn’t very good. Nice people, food not always as hot as it could be, roast pork always served cold on Tuesdays!!. Sun lounge area not really large enough for the amount of custom, but on the whole a good hotel. The bathroom is a little tight fitting even for an average sized person, maybe they should change the plinth around the basin to have curved edges instead of square!! Nice clean hotel, room nice an clean with fresh towels and bedding every day. Good facilities including a gym. The staff were friendly and helpful. The food was nice n fresh and a good selection...always found something we liked. The pool was fun for myself and my son..but quite tight for space around it, this caused a clamour early every morning for a spec an sunloungers..but if you want to avoid that, there is always the beach. I got food poisoning on my second last day, I couldn't leave my room. It was only a 5 day holiday and I spend 2 days of it being sick in my room. The chicken wasn't cooked properly. I was ill for about 3 days after my return home and it was just all together a terrible experience. Clean hotel areas and rooms. Food was sometimes cold. Small pool area and race for sunbeds every morning. Staff very friendly and helpful. No pool towels so had to go and buy some. Room was very nice and staff very helpful if asked anything. Hotel a bit difficult to find, we missed our transfer bus from Malaga due to plane being late and we had to get a train to Torremolinos then walk around trying to find the hotel - no one could tell us where it was. Hotel clean and tidy with friendly staff. Good choice of food and drinks. Food always hot not like most all inclusive. Different bar areas and entertainment each day. Would not let us check in till 3 when we arrived at hotel at 12 so we were stuck in jeans in temperature s of 36 the hotel pool and pool area is to way to small. But we still enjoyed our 2 weeks holiday there room was nice cleaned everyday food and drink was very good staff all friendly and helpful would go back but to a hotel on the beach next time.